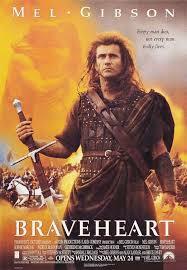 Braveheart (1995): Dir. Mel Gibson. Written by: Randall Wallace. Based upon the poem The Wallace by Blind Harry. Starring: Gibson, Patrick McGoohan, Angus Macfadyen, Sophie Marceau, and Catherine McCormack. Rated R for brutal war violence. Running time: 177 minutes. Believe it or not, there was a time where Mel Gibson was a viable box-office name; that is, before his drinking habits, discriminatory remarks and tabloid drama subsumed his image. Braveheart was made at a time when Hollywood still trusted Gibson’s integrity, winning the Academy over with its inspirational (if heavily fictionalized) depiction of the Scottish War for Independence. Taking its cue from a medieval poem, the film explores the legend of William Wallace, a Scottish commoner who fights against English rule in the late thirteenth/early fourteenth centuries. Originally neutral, Wallace leads the Scots when his new wife is executed for assaulting (in self-defense) an English soldier. Wallace proceeds to go on the warpath, raiding English garrisons and even attacking settlements in England itself. Gibson has all the elements here for a compelling epic, and he doesn’t quite squander them as much as hit us over the head with them. There’s a certain charm to its unabashed silliness, most of which I’m fairly sure was unintentional. As a director, Gibson shows flashes of brilliance, but knows nothing of subtlety. Whether with hero or villain, Gibson and screenwriter Randall Wallace seem uninterested in human complexity. Yet Gibson does succeed with his battle sequences, particularly the Battle of Stirling. Wallace prefers head games over brawn (as the film constantly reminds us), so we can appreciate the creative genius of battle plans that would make Sun Tzu proud. It also helps that every actor does solid work. Gibson has charisma and raw verve to burn as Wallace, and David O’Hara embraces the film’s operatic absurdity as the nutty Irishman Stephen. I’d be lying if I said I didn’t root for Wallace in his war against the English, but there’s not really enough here to warrant future viewings. Gibson makes no compromises with his directorial style, but that doesn’t mean he always succeeds.